Turner Lagpacan said he was grateful for his near-decade of involvement in the Boy Scouts when in April 2015, he encountered a fiery highway crash in Mulhall, Okla.
Lagpacan, who received a Carnegie Medal in 2016 for his heroic act, was featured in “Scouters in Action,” a comic series featuring adult heroes in Scouting magazine, a publication of the Boy Scouts of America. The issue featuring the Derby, Kan., resident appeared in the magazine’s May-June 2018 issue. It details the actions of Lagpacan, then 23, as he responded to a tractor-trailer hauling a cargo tank containing residual fuel and fumes that was involved in an interstate highway accident and caught fire. Despite growing flames and heavy smoke, Lagpacan reached the wreckage. He ran to a nearby truck and asked its driver for a fire extinguisher. As that driver grabbed two extinguishers and ran with Lagpacan back towards the truck, the cargo tank exploded, blowing them 20 feet away. Flames grew to engulf the truck, killing its 62-year-old driver. Lagpacan said he couldn’t believe his eyes when he discovered that he was featured in the comic series. Lagpacan said his scouting experience definitely aided him through the rescue. “The motto is to always be prepared,” Lagpacan said. Lagpacan wasn’t able to aid the driver, but he did help the other rescuer, who had suffered a deep wound to his leg from flying debris. Lagpacan tended to his injuries, using a tourniquet on the wound and staying with the man until help arrived. In addition to the Carnegie Medal, Lagpacan also received an Honor Medal with Crossed Palms through the Boy Scouts of America. That award is scouting’s highest award for bravery, Lagpacan said. Boys’ Life magazine, also through the Boy Scouts of America, has run a comic series focused on youth scouts, “Scouts in Action,” since the 1940s. Staff at Scouting magazine decided to create the adult series given the Boys’ Life series’s success, said Aaron Derr, a senior writer with Scouting. “Year in and year out, this is one of the most popular sections of the magazine,” he said. Thomas Eugene Foust saved an 83-year-old woman from being struck by a train on Sept. 8, 2007, in Glenview, Ill. The woman mistakenly drove her car onto a railroad track at a crossing, and the car became stuck as a passenger train approached on that track at high speed. Thomas, then a 17-year-old student, and others immediately ran to the car as the crossing’s gates and bell were activated, indicating that the train was about 30 seconds away. Thomas and his friends urged the woman to exit her car, and as the train bore down, he opened the driver’s door, unfastened her seat belt, and pulled the woman from the car, taking her 10 feet away and shielding her with his body as the train struck the car. The woman was shaken but uninjured. In May 2009, Elijah Jarred Wittum saved a 15-year-old boy from drowning in the South Yadkin River near Cooleemee, N.C. The boy shouted for help as he was swept downstream by a very swift current. Elijah, a 16-year-old high school student, was in wadable water near the bank and immediately entered the deeper water and swam downstream after the boy reaching him at a point about 30 feet out. Both boys then submerged, but Elijah broke free and surfaced. He went under the water, found the boy, and returned him to the surface. Holding to him, Elijah swam toward the bank as the current carried them downstream. They reached a tree that extended from the bank over the water, and Elijah grasped it. Men who were fishing nearby took the boy to safety, Elijah following. High school student Connor Farland Stotts, then 17, saved two teens from drowning in the Pacific Ocean on July 31, 2011, near Oceanside, Calif. The teens were carried away from the beach by a rip current and struggled to return to shore. Connor had also been carried out by the current, but he was able to swim against it to wadable water, en route taking one of the girls in the party with him. Seeing that the others remained stranded about 200 feet from the beach, Connor returned to them, finding that one person had taken in water and was having difficulty staying afloat. With that person holding to him, Connor swam a side stroke against the current toward shore, tiring and also swallowing water en route. At wadable water, the victim waded to safety. Connor again turned and swam out to the others. Another person by then was semiconscious and trying to stay afloat. Connor positioned himself under her and attempted to swim to shore, but he made no progress against the current. He then helped her secure a hold of his neck and in that fashion returned toward the beach, towing her, the remaining victims following. Nearly exhausted, Connor carried the girl from the water. For more information on the “Scouters in Action” series, visit scoutingmagazine.org/category/magazine/scouters-in-action. Information on the “Scouts in Action” series can be found at boyslife.org/contact-us/about-scouts-in-action. 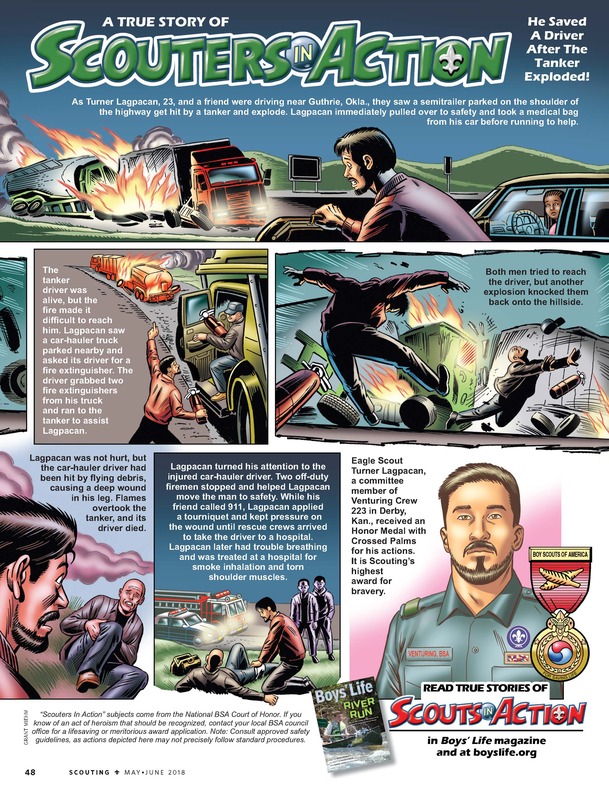 Title frame of Scouting magazine’s comic series featuring Carnegie Hero Turner Lagpacan. By permission of Scouting magazine, May-June 2018, published by Boy Scouts of America.